I was sitting at my desk on Friday morning, digimatizing some 45s and picking songs out for Funky16Corners when what should pop up in my Facebook feed but the news that the mighty George Jones had passed away at the age of 81. There have been a few posts here at Iron Leg over the years that hinted at my love for country music of a certain vintage, but I’ve never really gone into it in any depth. Like many rock’n’rollers in my age group, I backed my way into country music, mostly via covers of classic songs by groups like the Grateful Dead and the Flying Burrito Brothers. I found my way into country through ‘country rock’, which is really a way of saying that the real stuff was too potent to hit right away so I had to have it diluted first. Country music, much like disco, is a sound that in my early years I was always aware of but separated from culturally. Sure, I’d watch Hee Haw on Saturday mornings as a kid, and knew all the really big names, like Johnny Cash, Merle Haggard, George Jones and Buck Owens through their crossover into the general pop culture zeitgeist, but had almost no exposure to their music. It was only in the 80s, when I started to investigate the twangier end of the spectrum, especially Gram Parsons, that I found myself a gateway into the sound. Parsons, on his own and with the Flying Burrito Brothers introduced me to singers like Jones, Haggard and Owens in a way that I might never have discovered if left to my own devices. Because they took the time to pass it through a late-60s, ‘California hippie’ strainer, Parsons (who referred to his sound as ‘Cosmic American Music’), and folks like the guys in the Buffalo Springfield/Poco axis, as well as early adapters like Gene Clark, Mike Nesmith and Rick Nelson, made it much easier for someone like me to find my way, first to the Bakersfield sound, then on to guys like George Jones. Someone – I can’t remember exactly who, but the sentiment is general enough that it could have been any number of people – said that country music exists in some ways as a kind of “white man’s soul music”. The racial aspect of that is kind of simplistic, and I’d go as far as to suggest that it ought to be amended to say “another kind of soul music”. If you’ve spent as much time listening to music as I have, especially soul music, and then drill down into the soul of the deep south, you begin to realize that the borders that were drawn in our minds over the years, especially in regard to the constructs of race and music, and the way they effect each other, are often much more porous and flexible than we ever imagined. One need only listen to singers like James Carr, Arthur Alexander and Joe South* to realize that country, and soul are much broader categories than most people think. Though he would never fit the accepted mold of “soul singer”, George Jones was a singer with a remarkable amount of soul. 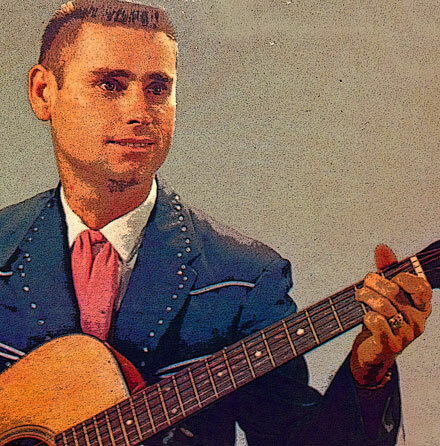 The first time I really “heard” George Jones it took me a while to reconcile the crystal clear, powerful voice with the public image of a tortured soul wrestling with alcohol and all the troubles it brought with it. Though there are many singers whose voices you could imagine in any number of contexts, George Jones pipes seemed purpose-built for country. High and clear, and fitting perfectly in close harmonies that sounded like they came down from the hills, his singing was country music. Jones always struck me as something of a raw nerve. One need only look at clips of him performing live and take a close look at his eyes to see what I mean. No matter what kind of song he was singing – and he was famous for tales of heartbreak – Jones always seemed to me to be peering warily from behind a wall of some kind. Having devoted so much of his resources to that incredible voice, which carried with it so much emotion, the look in his eyes betrayed a soul in distress. When you consider a life so filled with upheaval, much of it brought on by his own behavior, there was a temptation over the years to look at Jones and think ‘Man, he some kind of wild good ole boy!’, chuckling at the image of Possum defiantly riding into town on his lawn mower when his car keys had been confiscated. But there was nothing funny about it, and you could see that despite an occasional wry tip of the hat in the direction of that particular anecdote, Jones didn’t think it was either. Fortunately for Jones, his family and those of us that love his music, he managed to pull it all back together and live to a ripe old age no one could have imagined when he was at his worst. The two tracks I bring you today represent two sides of Jones. ‘She Thinks I Still Care’ was a #1 Country hit for Jones in 1962. It remains today, more than 50 years later one of the truly great records in the genre. It has been covered many times – the first time I heard it was via Leon Russell’s cover on his 1973 ‘Hank Wilson’s Back’ LP – and is one of the truly great statements of heartbreak. Listen to Jones’s version and marvel at what a remarkable singer he was. He lays down the first line of the song in a rich, almost conventional baritone, but by the time he reaches the end of the second line, his voice takes on another character entirely, stretching out and almost taking on the reedy sound of a fiddle (an effect that he repeats on the second line of every verse). If you get a chance, check out Little Willie John’s recording of the song, which is epic in its own way. 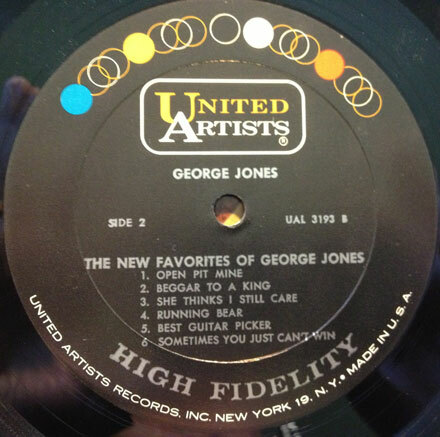 The second tune is a much more lighthearted number, touching on Jones’s rockabilly tendencies. One of his biggest hits was 1959’s ‘White Lightning’, written by JP Richardson (the Big Bopper) and as close to rockabilly as any mainstream country record ever came. ‘Root Beer’, which appeared on the same 1962 LP as ‘She Thinks I Still Care’, ‘The New Favorites of George Jones’ is in many ways a rewrite of ‘White Lightning’, this time on the carbonated, non-alcoholic side of the street. Though the production is Countrypolitan-heavy, that rockabilly vibe is still there, and it’s funny too, so there’s that. Jones went on to be one of the biggest stars of country music (alone and in duets with his third wife – of four – Tammy Wynette). If you’re not familiar with Jones, and wish to investigate further, there are tons of compilations out there of his early stuff (Starday, Mercury, United Artists) that can be picked up on CD or in iTunes. I hope you dig the sounds, and I’ll see you all next week. The tune I bring you today is another one of those things that I discovered in an auction, dug the sound and grabbed the record despite knowing nothing about it. Naturally, the sound is the main thing that matters, i.e. I love when a record has an interesting story behind it, but if the song is groovy, none of that matters. Fortunately, when I started doing a little digging, I turned up a couple of interesting facts. The Phaetons (or at least these Phaetons) hailed from Long Island, NY. They recorded three 45s for Warner Brothers records, all in 1967/68, and all, interestingly enough, produced by the great Jerry Ragavoy, better known as one of the finest soul music producers and songwriters of the classic era. The 45 you see before you today was released in 1968, and by catalog numbers appears to the the Phaetons last for Warner Brothers. Both sides of the disc are cool, melodic pop rock, with the flipside ‘You Better Come Back’ sounding like something the Left Banke might have put together in one of their more upbeat moods. The side we feature today is the groovy ‘Leave It To Me’. Interestingly, the song – written by legends Doc Pomus and Mort Shuman – was first recorded by the UK group A Band of Angels in 1965. That group, which featured future Manfred Mann singer Mike D’Abo took the song at a plodding, almost ballad pace (you can pick it up on iTunes as part of a Picadilly Records comp). 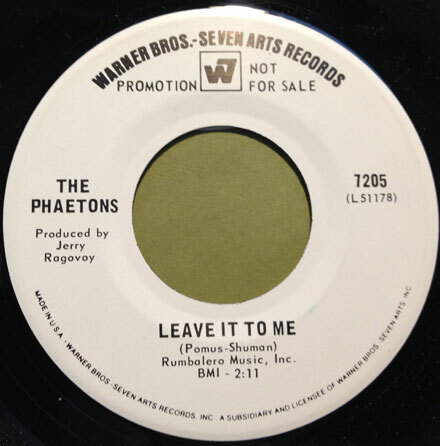 The Phaetons version of ‘Leave It To Me’ cranks up the tempo a notch or two, which really brings the melody to life. The group had excellent harmonies, and the guitar is especially nice. Lead singer Gerard Kenny went to to some success as a pop singer in the UK (also writing ‘I Made It Through the Rain’ for Barry Manilow) and some of the other members of the band recorded an LP in the 70s as Roland Jade. I hope you dig the tune, and I’ll see you all next week. 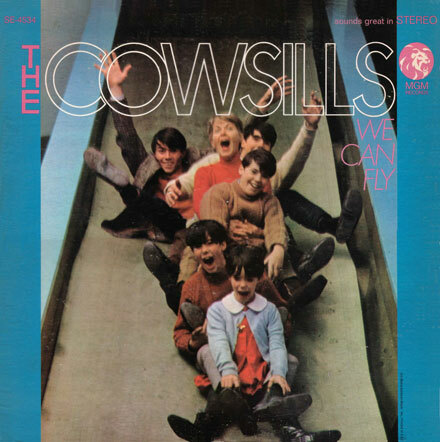 This time out you get a grip of stellar new arrivals, as well as the first part of survey of one of the truly underrated groups of the 60s, the Cowsills. This month you get some early rarities and non-hit album sides. Next month you’ll hear some of their later material, Bill Cowsill solo stuff as well as some other related rarities. As always, I hope you dig the show, and I’ll see you all next week. I hope the new week finds you all well. One of the hardest things to do, when you are as deeply into music as I am (I think “voracious consumer” would be a fair assessment) is to avoid becoming jaded. As someone to whom the golden years of pop/rock criticism were an important touchstone, I have also had to learn to realize that “consensus” is not always so, and sometimes you have to expand your reach (sonically, anyway) to make your own musical decisions. Iron Leg readers should already be aware that I am a huge devotee of harmony singing, especially in regard to sunshine pop, the Boettcher axis and all points on that line and associated tangents. I like nothing better than strapping on some headphones and immersing myself in records like ‘Monday Monday’ by the Mamas and Papas, ‘To Claudia On Thursday’ by the Millennium or ‘Just One More Chance’ by the Hondells, letting the remarkable mix of voices wash over me blissfully. One of the groups that lodged itself I my ears very early was the Cowsills. I can remember taping ‘The Rain the Park and Other Things’ off of WCBS-FM in New York on my old cassette recorder and listening to it over and over again. While I was certainly familiar – and enamored – with all of their hits, I never had more than a couple of their 45s in my crates. Then, a little while back I watched the 2010 documentary ‘Family Band: The Cowsills Story’. The film was – to say the least – an emotional roller coaster, and a revelation. I would strongly suggest that you check the film out when you get a chance for a look at a group that was both well-known and sorely underrated, and weathered a harrowing life off-stage. 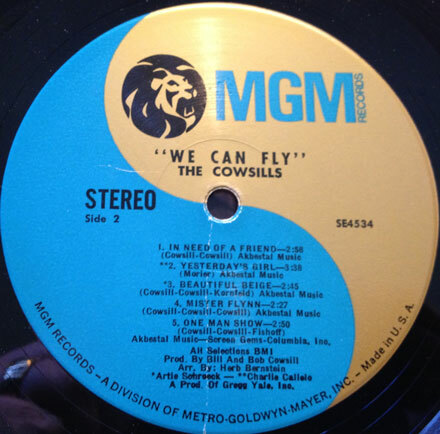 The biggest surprise for me was learning how deeply involved the Cowsills were with their own records as performers/composers/producers. I had always assumed – thanks in large part to their image – that the group was by and large a studio concoction. By the time the Cowsills signed with MGM, they had already recorded for both Johnny Nash’s JODA label, and Philips Records. The original group, which played live extensively was brothers Bill, Bob, Barry and John Cowsill (and later Paul). When they signed to MGM their mother Barbara was added to the group, followed by their little sister Susan on the ‘We Can Fly’ album. Though they often worked with seasoned pop writers like Steve Duboff and Artie Kornfeld (aka the Changin’ Times) , Gary Geld and Peter Udell, Bill and Bob Cowsill were writing their own material from the very beginning, with their originals often being far more interesting than their collaborations with others. What sets the Cowsills apart from a lot of the more obscure “sunshine pop” artists, is that their work had a remarkable consistency. Not only were they possessed of a stunning facility for close harmony, but Bill and Bob Cowsill (and later, Paul and Barry) were exceptionally talented songwriters. Of all of their albums – including their excellent later records like ‘II x II’ and ‘On My Side’ – the finest by far is ‘We Can Fly’. Released in 1968, and generating a hit (Pop #21) with the title track, ‘We Can Fly’ is as fine a sunshine pop album as was made in the era. Produced and (mostly) written by Bill and Bob,’We Can Fly’ manages to reflect bits and pieces of the musical counterculture without ever explicitly taking them on. 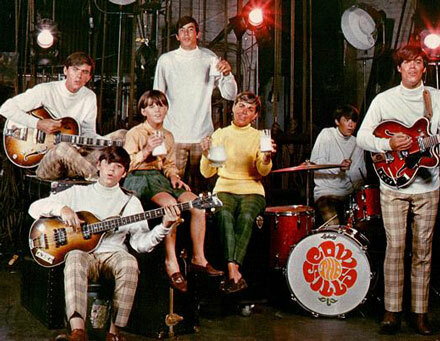 Despite the occasional psychedelic filigree, there was never a point where the Cowsills ever projected an image that was less than wholesome (see glasses of milk, above). It is however extremely important to note that while they also tread lightly into the realm of bubblegum, they were never cloying or juvenile. The feeling I get when listening to their albums (and that’s really how you ought to approach their body of work) is that they were constantly striving for – and usually achieved – musical sophistication. The two tracks I bring you today are my favorites from ‘We Can Fly’, though it should be said in advance that there’s not a duff track on the album. ‘Gotta Get Away From It All’ is an upbeat, swinging cut with that popsike-once-removed vibe that you hear on so many of the best Monkees cuts. There are a couple of ill-advised bits of sonic gimmickry but not enough to tarnish the track, which also features a great vocal by Bill. Interestingly, ‘Gotta Get Away From It All’ appeared on a 45, backed with one of the tracks (‘The Prophecy of Daniel and John the Divine’) from that year’s ‘II x II’ album. ‘In Need of a Friend’ was the second single released from ‘We Can Fly’, and despite its obvious beauty, just managed to graze the outer limits of the Top 50. The song has the kind of bittersweet melody that would have fit on any Left Banke album, or with some of Paul Williams’s early solo material. Though the term ‘lost classic’ gets bounced around by collectors all the time, ‘We Can Fly’ really fits the bill. Even though I often find myself neck-deep in “sunshine pop”, when it’s carefully considered it becomes obvious that the term is an umbrella under which reside a whole lot of different things. When you talk about bright, upbeat (often successful) pop music, there’s a temptation to question the authenticity of the acts in question, sometimes because we’ve come to expect a certain level of “seriousness” in the music of the late 60s, but also because so many of the “bands” in the genre existed only in the studio, or were “false fronts” for songwriting/record making factories. On the first point, I’ll just go ahead and say that ‘seriousness’, at least as a musical point is overrated, and too often applied where terms like ponderous and pretentious would be more fitting. Second, a careful investigation of the landscape – at least as far as most records were made during the era – will reveal that sometimes even the most ‘serious’ bands had as much help in the studio as the supposed lightweights. It also pays to say this again: they not only played their own instruments but also wrote (and produced) their own records, which sets them well outside of the musical ghetto that many people would try to force them into. Just because the Partridge Family was modeled on the Cowsills, doesn’t mean that the Cowsills were the Partridge Family (if you follow me). Sadly, Bill Cowsill was forced out of the group that he led in 1969. The group went on to record two more LPs after his departure, one for MGM and their last for London. Bill went on to record a fairly cool (and very obscure) solo album for MGM in 1971, as well as producing other bands like Bodine. The Cowsills story, especially the last few years of their first incarnation is an extremely interesting one. I may have to put together a mix of their lesser known stuff sometime in the future. Until then, make sure you check out ‘Family Band: The Cowsills Story’. It’ll give you a new respect for a band you probably overlooked. Oddly, though it has been reissued on CD (with – alas – no bonus tracks), “We Can Fly” is unavailable on iTunes. You should however be able pick up a copy of the original LP for under $10.00.